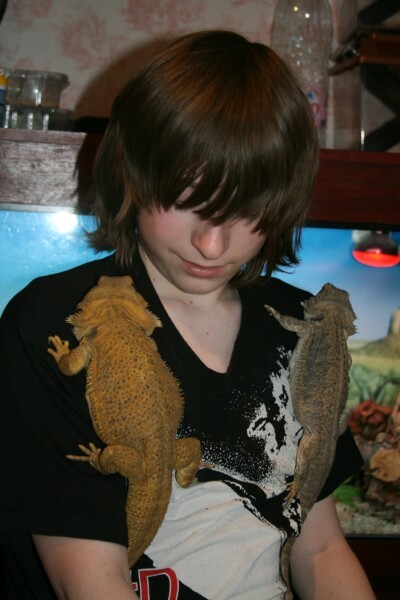 Michael and his Bearded Dragons! I named the Beardie Lizzie - my Auntie Annie has numerous snakes and lizards in her house (as well as a menagerie outside!) and hadn't got round to naming everyone. Annie works at Blue Skies Wildlife Reserve in Poway, and often gives house room to rescued animals. 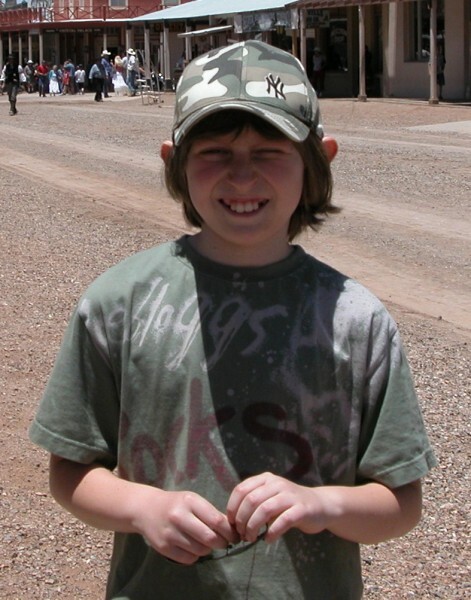 When I got back from our holiday I got some books on Bearded Dragons and started a persuasion campaign to get my parents to buy me a pair for my 12th birthday on July 28th 2006. This is the story of how I came to get my dragons, how I prepared for them, and will share with you pictures of them as babies and as they grow to maturity. I share my Aunt's love of animals, and will be making a lot of effort to train my dragons so they become just as tame as Lizzie, who would sit quietly on my shoulder as I walked around her house. This is my mum, Trish, who helped me set up this website. She has her own website called www.limebrook.com about the livary yard and riding stables where we keep our horse, Jazz. Also please visit www.pets4kids.info about other pet ideas! Why am I doing this website? Bearded Dragons make excellent pets for children (and adults! ), but you have to know what you are taking on to make sure you can give them a good home and keep them happy and healthy. I first had to persuade my parents that I was ready to move on from a hamster to something that needed a lot more care and attention. If you, like me, would like to keep beardies it is a good idea to find out everything you can about them so you can answer your parent's questions, and convince them that you will make a good bearded dragon owner! If you have always wanted a Bearded Dragon and don't know how to get or keep one this website is for you! What you need to consider! The idea of having a bearded dragon as a pet is a lovely one - but it is not a cheap hobby! We began to find this out very quickly. So this site is how to set up your vivarium properly, and hopefully without spending an absolute fortune! This site has been designed using Blue Voda, and is hosted by Vodahost, the great value host with terrific customer service! This picture shows me with Shrek and Fiona, my lovely bearded dragons one year on! I hope you enjoy the experience with me! These lizards have great characters and are loved by everyone! I would thoroughly recommend them as pets. Join our forum especially for owners of Bearded Dragons or if you are thinking or getting a beardie and want some advice! Shrek and Fiona are now the proud parents of 37 baby bearded dragons. Each one promises to be as colourful and friendly as its parents. Breeding Shrek and Fi, incubating the eggs and seeing them hatch has been a wonderful experience for me, and one I hope you will share with me through the pages on this website! 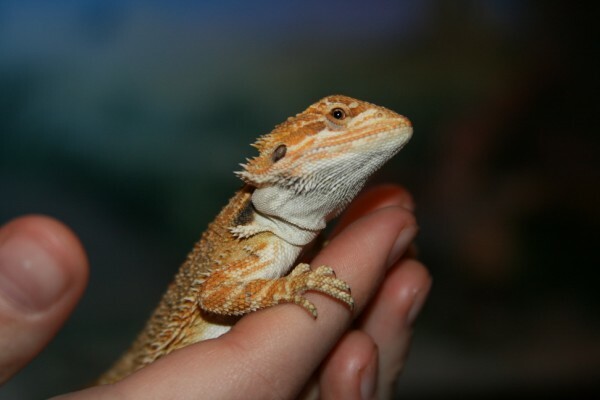 This site is now updated with my experience of keeping beardies from babies just a few weeks old, to adults who are breeding and have laid a first clutch of eggs! I am now also able to share with you my experiences of breeding, hatching eggs to selling baby bearded dragons. I might not always do things right, but this is the way things have worked out for me! Your browser does not support inline frames or is currently configured not to display inline frames. Please scroll to the bottom of the page to see other menu options.